While a strong work ethic and keen mind are important determinations for student success in the classroom, the level of support that students receive at home from parents is increasingly being recognized as an important influence on academic achievement. Studies have shown that when parents are involved in their child’s education, the academic achievement of the child improves. 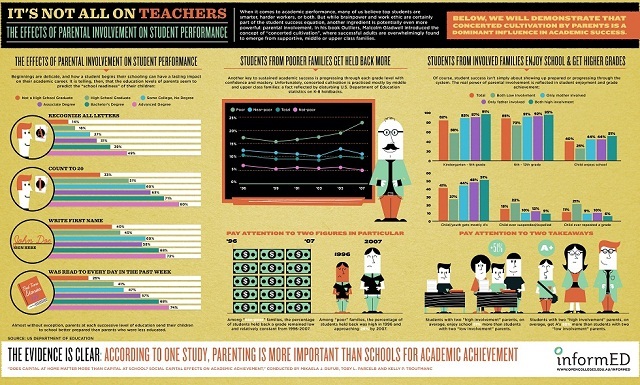 Not only is the level of parental involvement at home a major factor for student success, but the the higher level of academic achievement of the parents, the more likely students will achieve academic success themselves. In this infographic created by Open Colleges, a number of findings from studies have been illustrated. To view an enlarged version of the infographic, click on the image above. Students with two “high involvement parents” on average enjoy school 51% more than students with two “low involvement” parents. Students with two “high involvement” parents on average earn A’s 52% more than students with two “low involvement” parents. How do you encourage parents to become involved in your students’ academic life?